Is there a fruit tree in your future? Having a home orchard is a magical experience each year when your trees burst forth, first in leaves, then delicate, fragrant blossoms heralding the exciting arrival of your own fresh fruit! Now’s the time to take advantage of great deals on quality trees to start or expand your home orchard for next year thanks to our amazing new ‘Soft Order’ Fruit Tree Program. Simply order the tree or trees you want from our comprehensive list now through Oct. 31. Your trees will arrive in early January in bare root form, ready for immediate planting at the best time of year. Dave Wilson Nursery, one of our top fruit tree growers, supplies these wonderful trees. Dave started in 1938 on a small piece of rented ground and the nursery has grown to one of the largest growers of deciduous fruit, nut and shade trees in the U.S.
Dave Wilson Nursery is now owned and operated by the family’s third generation who farm more than 1,000 acres and grow over four million trees a year. Evergreen Nursery stocks about two dozen of their finest fruit tree varieties that include apples, stone fruits and grapes. 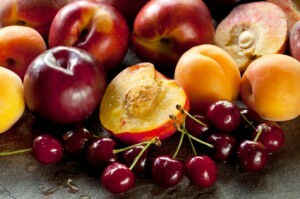 In addition to traditional favorites – Gravenstein apples; Bing cherries – there are new favorites such as ‘Double Delight’ nectarine that packs a punch with its magnificent pink double flowers in addition to its succulent yellow fruit. Rare and unique varieties include apriums, pluots and ‘Donut’ – a white peach with a sunken center. ‘Muscat of Alexandria’ grapevines deliver large, juicy fruit suitable for table, wine or raisins. Come into Evergreen where we can provide more details on growing fruit trees in our beautiful Bay Area and help you choose varieties from our impressive collection. Click here for the full list – and place your order soon!